Key Message #3: Nurses should be full partners, with physicians and other health professionals, in redesigning health care in the United States. CNC-AC is planning programs to develop nurse leaders from bedside to boardroom and beyond. CNC-AC partners with The Connecticut Nurses Association to address critical healthcare policy issues. CNC-AC supports the national Nurses on Boards Coalition to monitor and promote nurses for leadership positions on boards of directors. Be sure to visit the NOBC website to have your board service counted, to be considered for board service, and to learn more about serving on boards. 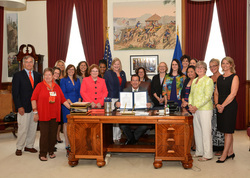 CNC-AC congratulates its Nursing workforce for expansion of APRN Scope of Practice SB-36 signed into Connecticut Law May 8, 2014. Passage of this bill expands access to health care for Connecticut citizens by broadening the scope of practice for Advanced Practice Registered Nurses. The Connecticut Advanced Practice Registered Nurses Society partners with CNC-AC. CNC-AC supports the Mentorship and Meeting Program developed by the Northern Connecticut Black Nurses Association to recruit and support diverse students interested in a professional career in Nursing. The Northern Connecticut Black Nurses Association is an active CNC-AC partner.